Home » Blog » Are click free interfaces a good idea? 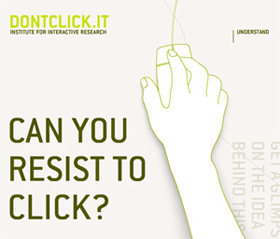 Are click free interfaces a good idea? The dontclick.it website has been around for a good few years now, but I stumbled upon it again recently and it’s experimental click free interface got me thinkingI have noticed a number of widgets on web pages that feature click free interfaces such as accordion menus that open and close on rollover. These click free interfaces are unintuitive and usually result in frustration for the user as they don’t work as expected and are often fiddly to activate. It’s all due to the lack of mouse clicking. The mouse click has been around for nigh on 30 years now and it would be easy to think that it is a matter of habit and that click free interfaces would work fine once we got used to them. Personally I think the mouse click is far more important than that and is an essential part of the human-computer interface. the fact is that we need that positive action and reaction to let us know that our actions are actually having an effect. This is why buttons go clunk and shampoo foams. Having events occur without this definite interaction and users are left feeling disconnected and out of control. A real world example of where this feedback is lacking is in those mobile telephones that have a combination of standard push buttons along with touch sensitive ones. Everyone I know who owns one hates it. You are never quite sure if the button has worked properly when you press it, especially if there is a delay on the function you selected, so you press it again and end up 2 steps ahead of where you wanted to be. You pass the phone to someone and as they take it their hand brushes one of the buttons opening up a bunch of menus. Take this online and you have similar problems with the dontclick.it site. As you move your mouse around it sets off a whole chain of navigation that was totally unintended, you feel lost and confused and have no idea of the actual navigation structure without spending the time to figure it out. Hardly intuitive. Now I’m not criticising the dontclick website, it is deliberately experimental and performs that role admirably, but if anything it reinforces just how important definite actions and reactions are in interface design, stray too far and you leave your audience alienated. Those rollover accordion menus are a little too clumsy and intuitive but swap the rollover for a click and you have a perfectly usable navigation tool. Mirroring real world usability online makes perfect sense as you immediately put people in an environment that they are comfortable with from their everyday lives. There is certainly a place for experimenting and that is on experimental creative websites but if you are designing a company site for a client then you should stick with established methods. Site visitors are unlikely to appreciate being used as guinea pigs when all the want is to find a single piece of information.